Bad Astronomy 's Phil Plait joins Annalee Newitz and Esther Inglis-Arkell on io9's We Come from the Future show to discuss bad science in movies about Mars. They also talk about how terraforming Mars might really work - not surprisingly, not like it's depicted by Hollywood. Just what the title says: yo-yoing on the space station.Looks like fun - and it's physics! How might humans evolve if we settle on Mars for the long term? Just one of the topics on this week's StarTalk podcast. (Also possibly more than you wanted to know about peeing on a spaceship). "The bottom line is that Hollywood aliens are mostly reflections of ourselves, and hardly accurate ciphers for real extraterrestrials. Read the whole article to see why Hollywoods portrayal of aliens is still important. The PLoS podcast talks to biology professor Gerald Joyce about how we would know if a new lifeform is truly alien or not. Joyce argues that the important question is " How many heritable “bits” of information are involved, and where did they come from? A genetic system that contains more bits than the number that were required to initiate its operation might reasonably be considered a new form of life." Is the universe made for us? "At the heart of modern cosmology is a mystery: Why does our universe appear so exquisitely tuned to create the conditions necessary for life? In this tour de force tour of some of science's biggest new discoveries, Brian Greene shows how the mind-boggling idea of a multiverse may hold the answer to the riddle." Carotinoid pigments in aphids appear to allow them to turn light into energy - like photosynthesis in plants. Maybe the engineered humans with photosynthetic skin described by SF writers like Joan Slonczewski and John Scalzi isn't so far fetched. "One of the scientists involved in the project, Bryan Sykes, sees this as a catch all for those who claim science brushes them off. ““It’s one of the claims by cryptozoologists that science does not take them seriously. Well, this is their chance. We are calling for people to send us their evidence, and we will test it through DNA analysis,” he told the BBC." Using DNA to encode a story. Seems like you could use the process it to send secret messages if you (and your message recipient) had the technical ability to do that. Evolution within an individual: shown to be possible in continuously growing trees, but I'd guess pretty unlikely in most animals . Geneticist Elizabeth Finn explains the genetics in Game of Thrones - it's all about the hair, of course! It turns out hair shafts are full of DNA sheathed in "biological plastic" (keratin). It's protective enough so that external bacteria and other contaminating DNA sources can be washed away before analysis. And it's allowed scientists to analyze 50,000 year old DNA from wooly mammoths. The down side is that hair shafts only contain mitochondrial DNA, rather than nuclear DNA, meaning that what we can learn from the DNA of such extinct animals is limited. But it's better than nothing. Ed Yong looks at the current state of prenatal gene therapy. While there have been some positive recent advances in gene therapy in children, no one has tried gene therapy in human fetuses. Considering the risk involved, and the complexity of many human genetic diseases, that may not happen any time soon. Developments in "bio-pharming": scientists have engineered carrots to produce a human enzyme to treat patients with Gaucher disease. It's cheaper and potentially safer than therapeutic biochemicals produced in animal cells. It lends a whole new meaning to the directive to eat vegetables for health! Color perception is a concern of neuroscience, psychology, and philosophy. You might say it's all in your mind. A recent study shows the nightingale wren's song isn't like human music - it's more like talking. "The birds we prize most for their songs sound most like the human voice, says Robert Zatorre, a cognitive neuroscientist at McGill University in Montreal, Canada, who was not involved in the study. The sounds they make have clear tones, repeat similar phrases, and are made of discrete notes. Despite these pleasing attributes, however, it has never been scientifically proven that the notes in birdsong follow the same organizational rules that govern most musical compositions." Yes, the article is sensationalized (and the tatooed woman in a bikini photos are gratuitous) but Renfield's Syndrome is a real clinical diagnosis. Read the article for more. All of our senses are limited: vision, hearing, taste, touch. Will we eventually overcome them with biological enhancements, either organic or mechanical? What do you think? "A recent work of science-fiction, called New Model Army , by English author Adam Roberts examines what the world may look like were humans to submit their individual consciousness to a hive mind, where the aims of the collective were more important than individual concerns. While the novel is set 25 years in the future, much of the book reflects on today's technological advances. "In short, imagine groups arising that resemble Anonymous, whose extemporaneous self-organizing projects [are equipped] with better communications and an interest, not in hacking websites, but in fighting and killing for money." "Scientists are a long way, of course, from “mind reading” — deciphering complex, abstract thoughts in real-time. With current brain decoding technology, a neuroscientist may be able to tell that you are looking at an image of, say, an apple rather than an orange, but it cannot unscramble all your complex thoughts about that image, such as your memories of apple picking as a child." What sets the human brain apart from the other apes? It looks like it may have been a simple gene duplication error. The duplicated gene - SRGAP2C - appeared about 2.4 million years ago "around the time that big-brained species of Homo evolved in Africa from smaller-skulled Australopithecines, and around the time that stone tools appeared in the fossil record". Expressing the mutated human gene in mice caused them to develop denser connections in their brains. Is that what makes humans "smarter"? 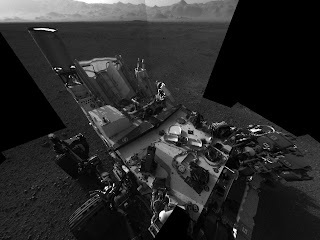 Image: Still Life with Rover: This self-portrait shows the deck of NASA's Curiosity rover from the rover's Navigation camera. Click the link for more information.